Number of castellers on each level of the trunk. This indicates the number of rengles (pillars) the trunk consists of. Number of levels. The minimum number of levels a structure must have to be considered as a castell is six, except for pillars, which are made with four levels and upwards. 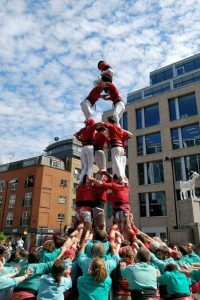 In such a way, a 4of6, for example, means that the trunk is made of 4 castellers at each level (except from the pom de dalt) and that it consists of 6 levels. Castells can be divided in two main groups: simple structures and complex structures. These consist of one, two, three or four castellers per level. This structure has one casteller per level. In a pillar, each casteller in the trunk holds with his/her arms the casteller above. This is the only structure in which the pom de dalt is only formed by the enxaneta, there are no dosos or acotxador. The pillar is crowned when the enxaneta raises one of his/her arms and places the other on his/her waist. This structure has two castellers per level. 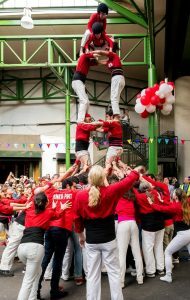 The pom de dalt is formed by four castellers: a pair of dosos, the acotxador and the enxaneta. The torre is the only structure in which the dosos stand in the same position as the rest of the trunk, i.e. the dosos place both feet on the shoulders of the casteller in the level below. The acotxador and the enxaneta, climb on different “pillars” called rengles and after doing the aleta at the top of the castell, they cross and come down on the opposite rengla. Rengla – the middle pillar where the dos tancat climbs. The dos tancat takes the same position as the casteller in the level below placing both feet on his/her shoulders. Plena – the pillar on the right hand side of the rengla where the dos obert and enxaneta climb. The dos obert takes an open position placing one foot on each remaining pillars. The dos obert climbs and goes down on the plena and the enxaneta climbs on the plena and goes down the rengla. Buida – the pillar on the left hand side of the rengla where the acotxador climbs up and goes down. 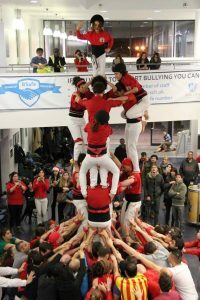 This structure is formed of four castellers per level forming a square. In the trunk, the castellers of each level do not take each other’s arms but take the ankle or lower part of the leg of the castellers that stand on each side of the level above. 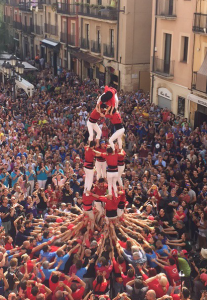 The pom de dalt is made of four castellers: a pair of dosos, the acotxador and the enxaneta. The dosos place themselves in an open position (dos obert) by placing their feet on the shoulders of two different rengles. Each dos climbs and goes down on a specific rengla whereas the acotxador and enxaneta climb and go down on opposite rengles and cross at the top of the castell. This makes this castell more stable than a three as the weight is more evenly balanced. With more than four castellers per level, complex structures are made of combinations of simple structures. This structure is made of the combination of a castell with a pillar in the middle. In castells of 6 levels, the pillar is of 4, in castells of 7 levels, the pillar is of 5 and so on. The castell and the pillar are raised simultaneously. The pillar is built without the last level since the last level is made with the enxaneta or acotxador from the main castell. The main castell is crowned and starts coming down. At that point, the enxaneta or acotxador of the main castell move inside the pillar and crowns it. As soon as the segons of the main castell let their arms go and the segon of the pillar is left alone on the pinya, the castell is considered officially crowned. 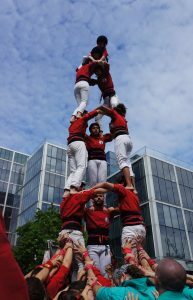 This structure is formed of five castellers per level. It is made of a structure of three and a torre that is attached to the rengla of the three. This structure has two poms de dalt: the pom de dalt of the three and the pom de dalt of the torre. It is made of seven castellers in total: two pairs of dosos, two acotxadors and one enxaneta. The entrance and exit of the dosos and the acotxadors are as per a normal three and a torre. The only difference in this structure is that the enxaneta who climbs up on the plena, does first the aleta on the three, then moves on to the acotxador of the torre and does the second aleta and comes down on the pillar of the torre that is on the left hand side from where he/she has climbed. 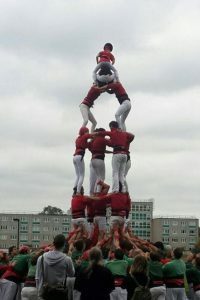 This structure is formed of seven castellers per level. It is made of two structures of four which share one rengla. This structure has two poms de dalt and is made of two pairs of dosos, two acotxadors and one enxaneta. This structure is formed of nine castellers per level. It is made of a three that is left at the centre of the structure and three torres, each one attached to a pillar of the three. This structure has three poms de dalt and is made of three pairs of dosos, three acotxadors and three enxanetas. 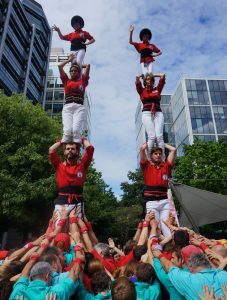 These are castells which, despite having a simple structure, stand out because of the way they are raised or because they lack the usual support base. The structures that normally are built following the technique of lifting are the pillar and the three. First the enxaneta is placed on the shoulders of the casteller in the level below. Then the casteller in the next level below kneel on one knee in front of the other two. The lifters then lift the upper levels and place them on top of the last casteller. The castellers that get into the pinya to be lifted are lifted by being grabbed under their arms and the faixa. Once the entire pillar is complete, the pinya closes and the castell is considered crowned. The pillars per sota are brought down following the inverse procedure. Watch CoL building a pillar per sota here. First the acotxador is placed on the level of the dosos which are standing on the ground. The dosos are lifted and placed on top of the last level of the trunk. The enxaneta on the plena while the trunk is lifted. Next, the following levels of the castell are lifted in a similar way as done with the pillar. As soon as the baixos are lifted, the pinya closes and the enxaneta does the aleta and the castell is considered crowned. Watch CoL building a 3of6 per sota with Sagrada Familia here. These structures follow the same technique as the normal castells with the difference that the castells nets have no support of a pinya, leaving the segons without support. Most of the castellers who would normally be in the pinya take the same positions as they would in a normal castell but without touching the castell.